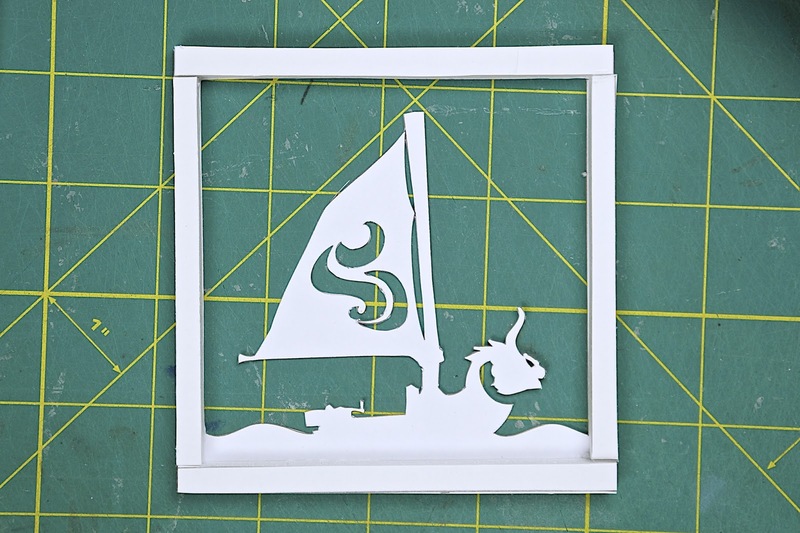 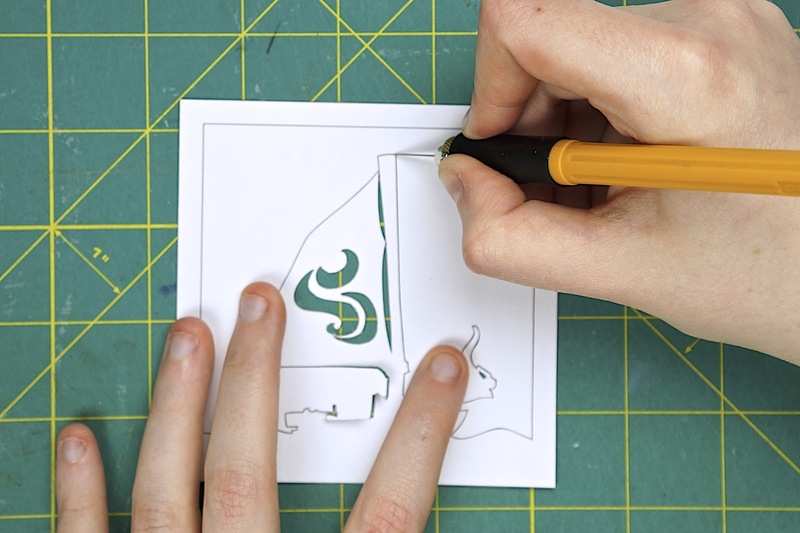 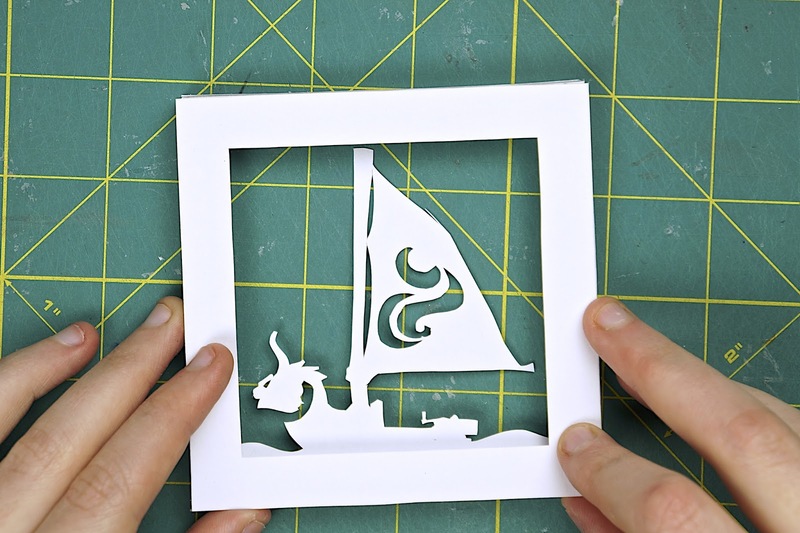 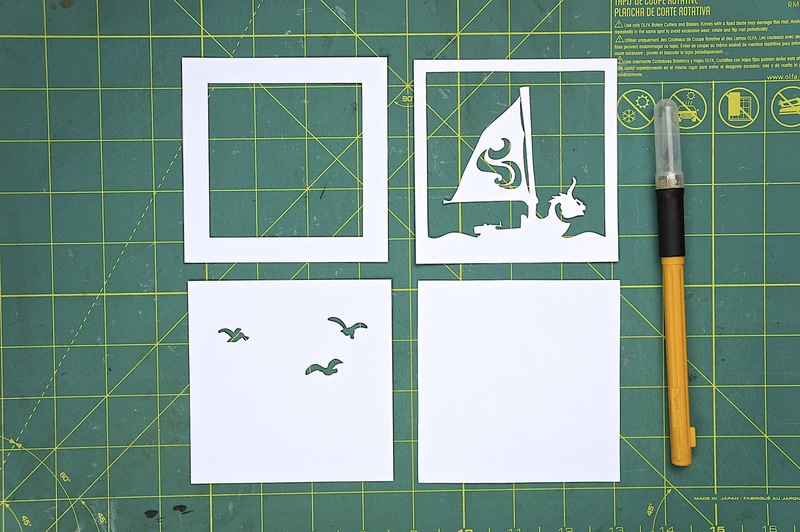 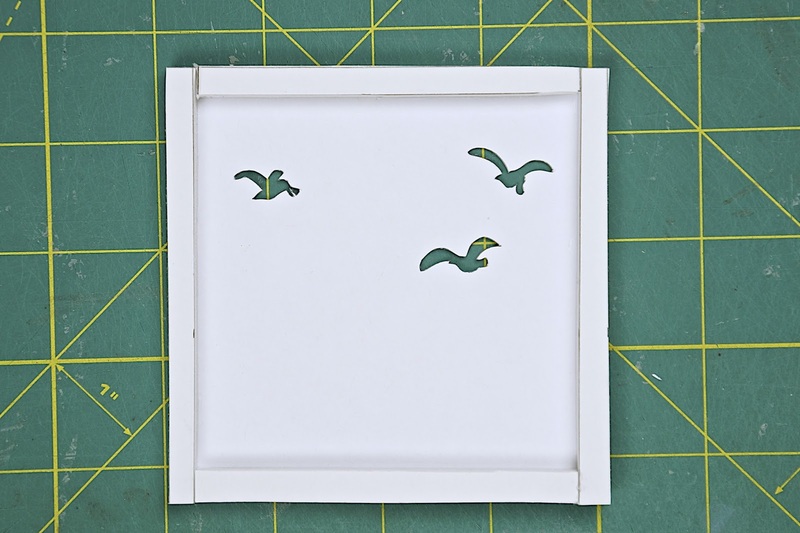 First you will need to choose one of the mini lightbox ornament templates and print it onto some cardstock paper. 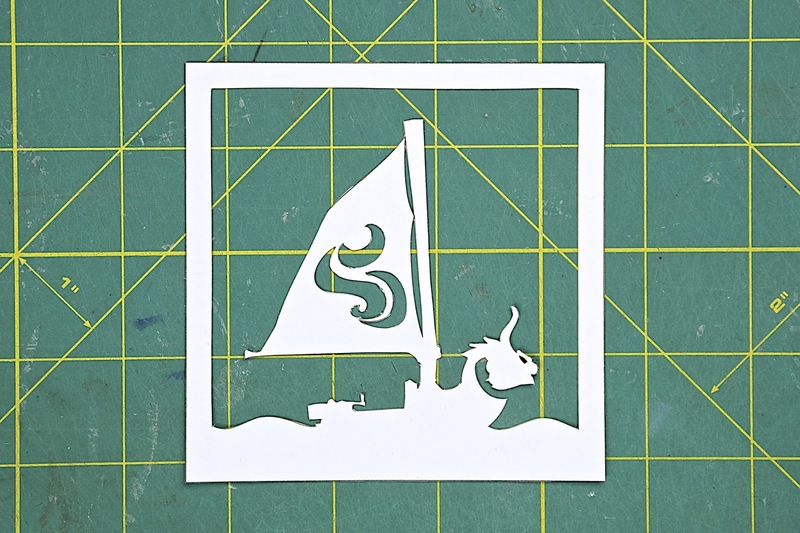 The templates can be found here. 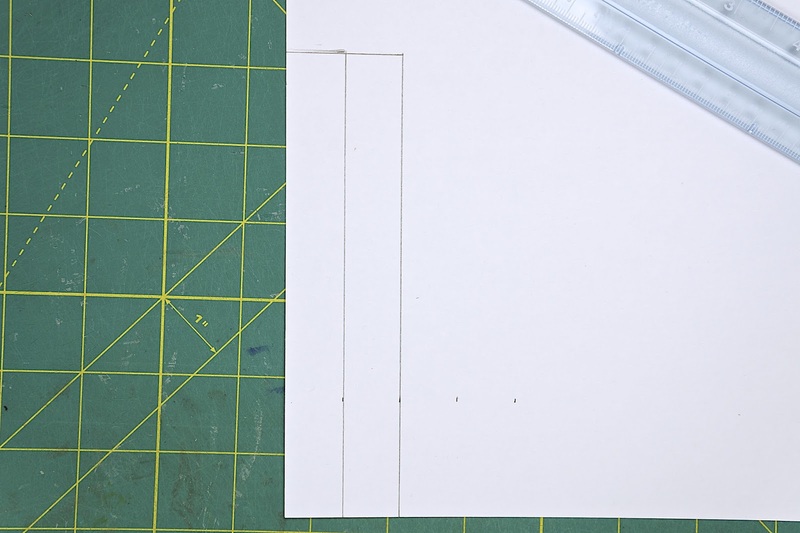 Carefully cut out all of the template pieces. 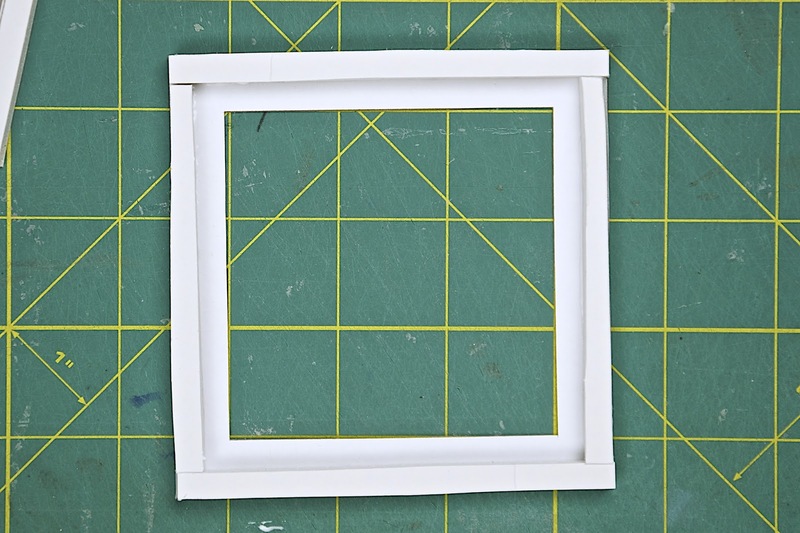 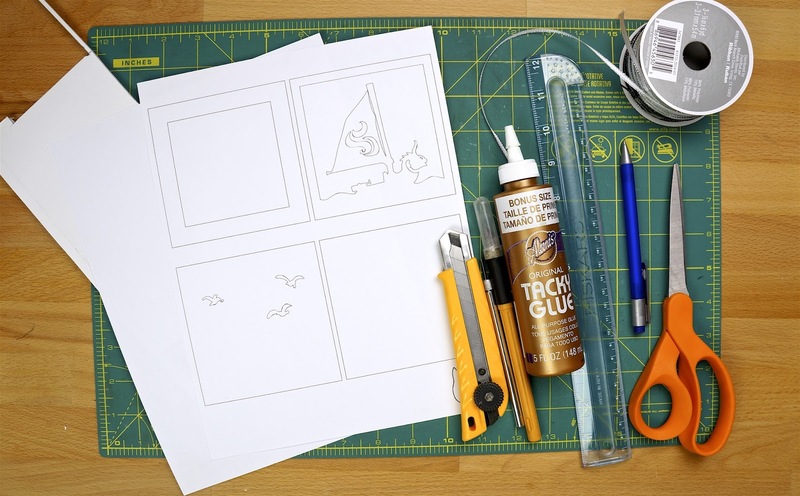 Measure and mark strips that are 4" long by 1/4" wide onto your foam board. 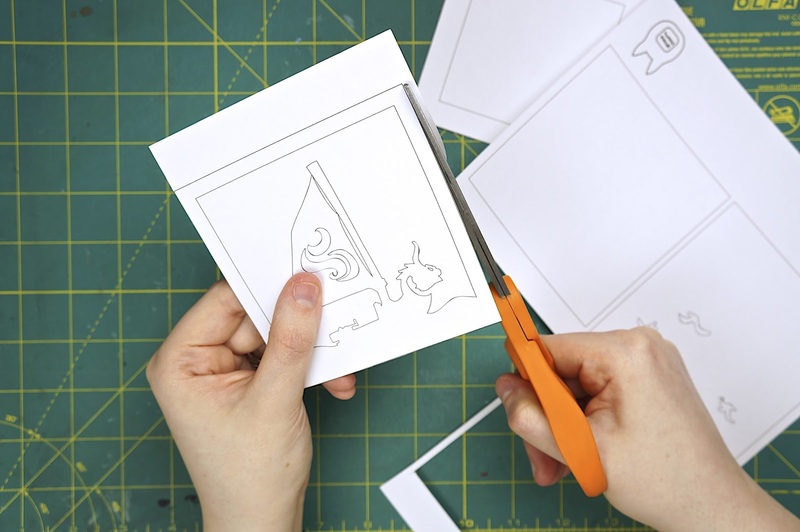 You will need 2 for each cut out layer (not the back piece). 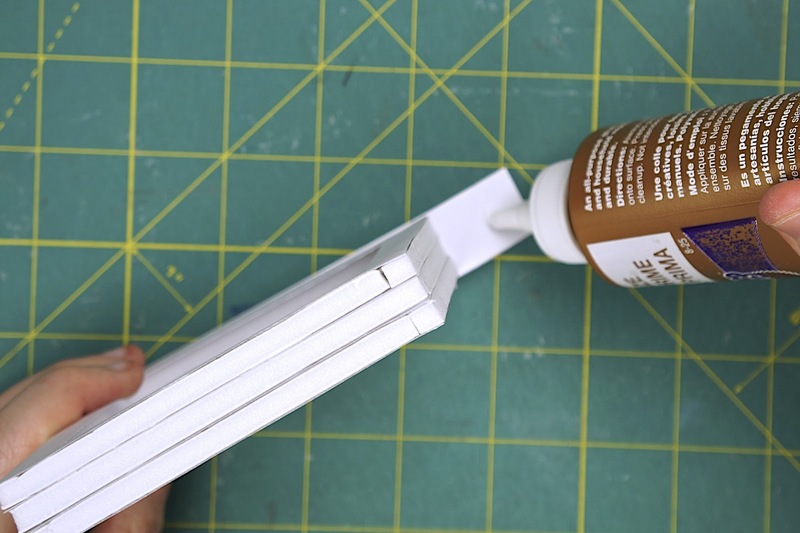 Cut out your foam board strips. 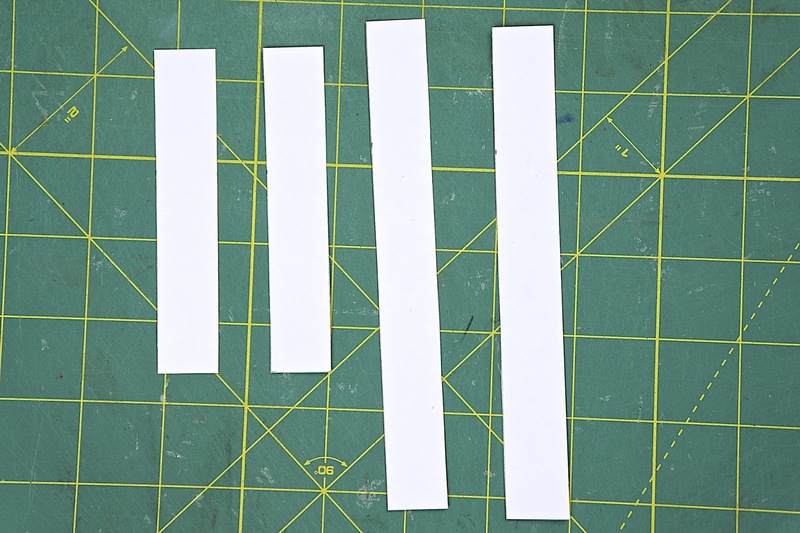 Repeat the same steps for another set of strips, this time 3.5" long and 1/4" wide. 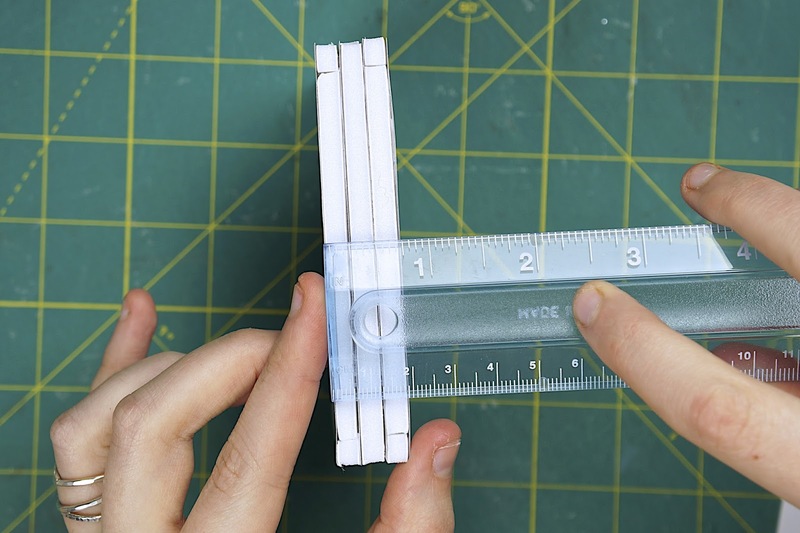 You should have an even amount of 4" and 3.5" long strips. Glue one of your 4" long strips to the backside (the side that has the ink on it) of one of your lightbox layers. 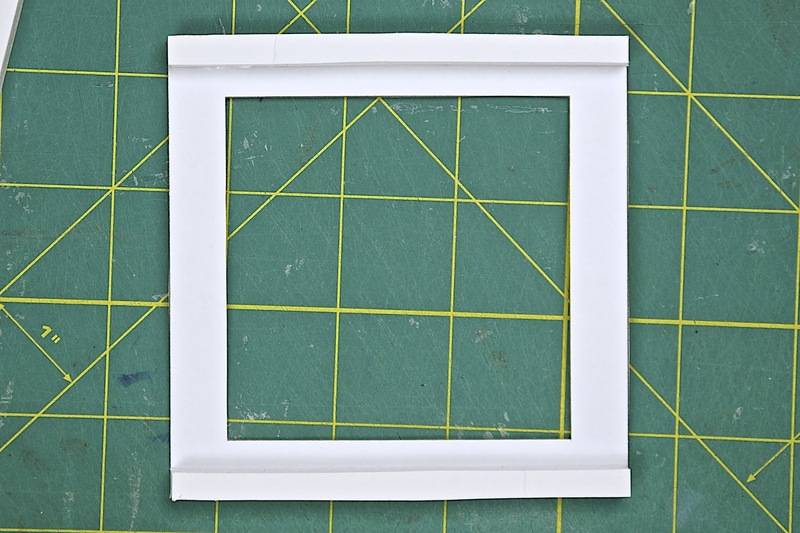 Glue another 4" strip to the opposite side of the square. 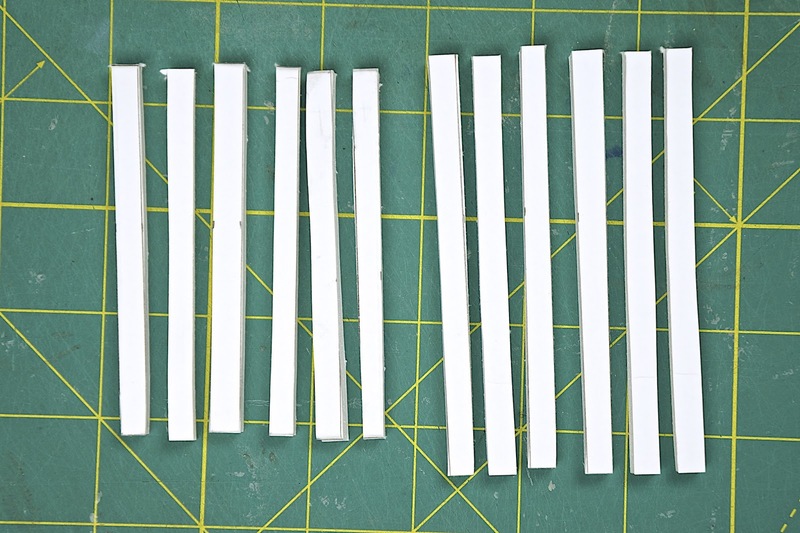 Glue two 3.5" long strips to the remaining 2 sides of that layer. 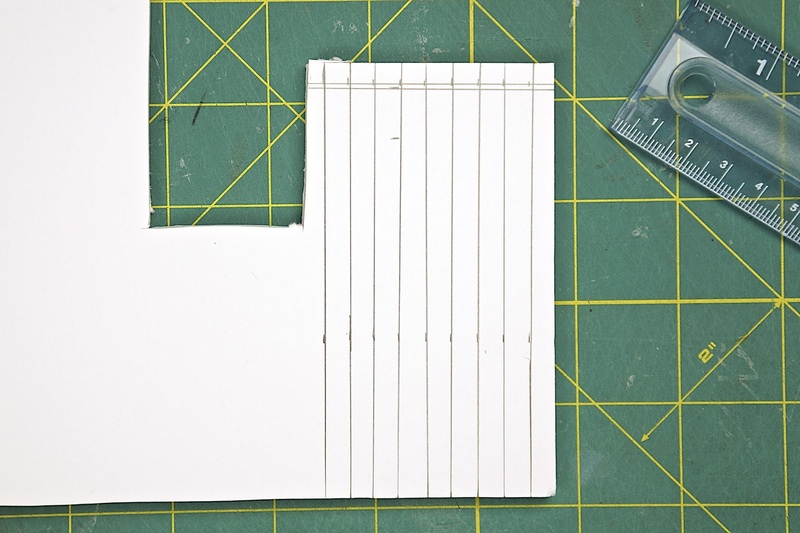 Repeat the same steps for the other layers. 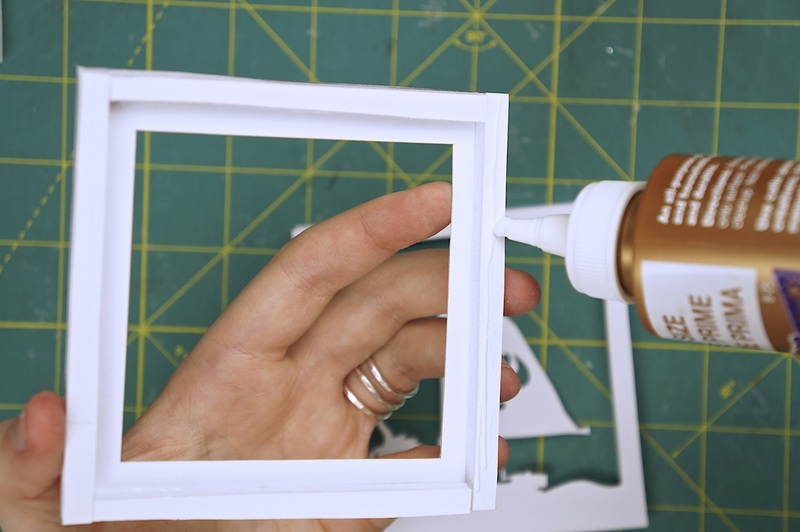 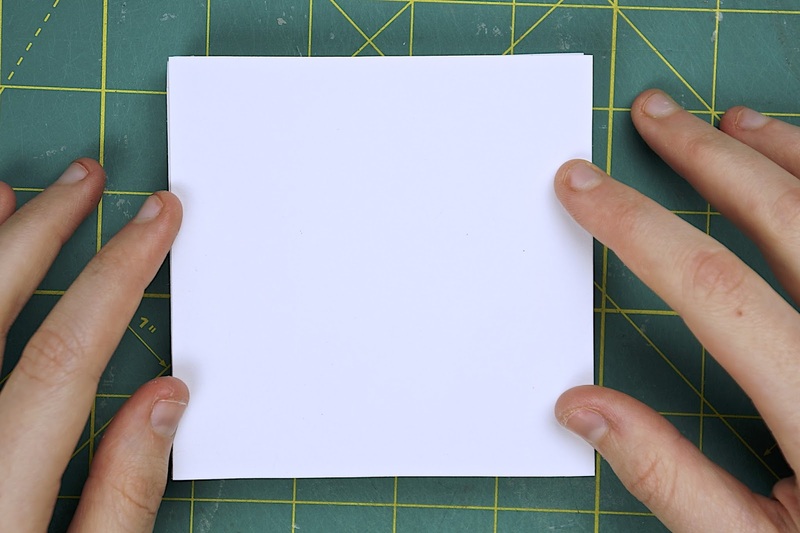 Glue your lightbox layers together. 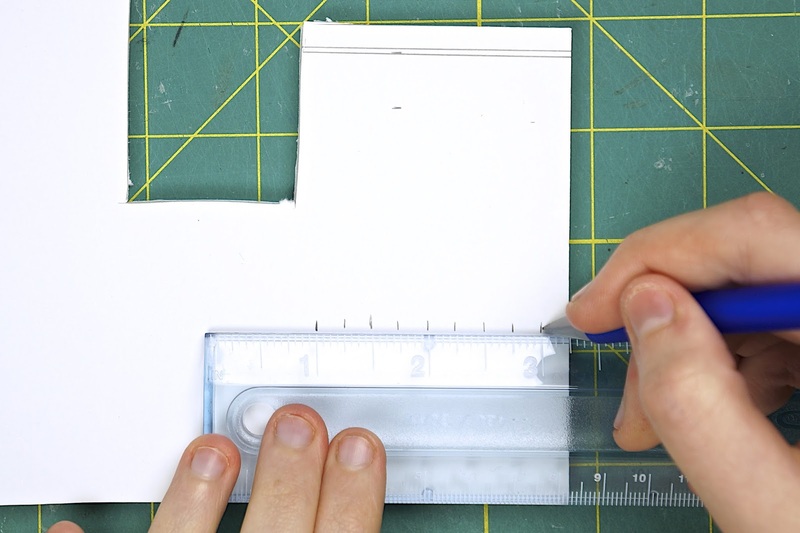 Measure the thickness of your lightbox. 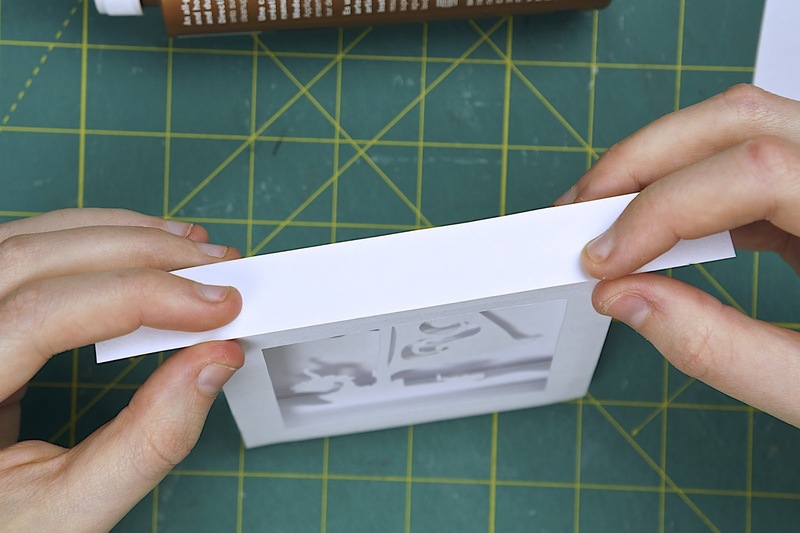 Measure and mark 2 strips onto some blank paper that are the thickness of your lightbox by 1 to 2 inches longer than the length of your lightbox (if your lightbox is 4" long, add 1" or 2" to have a 5" or 6" long strip). 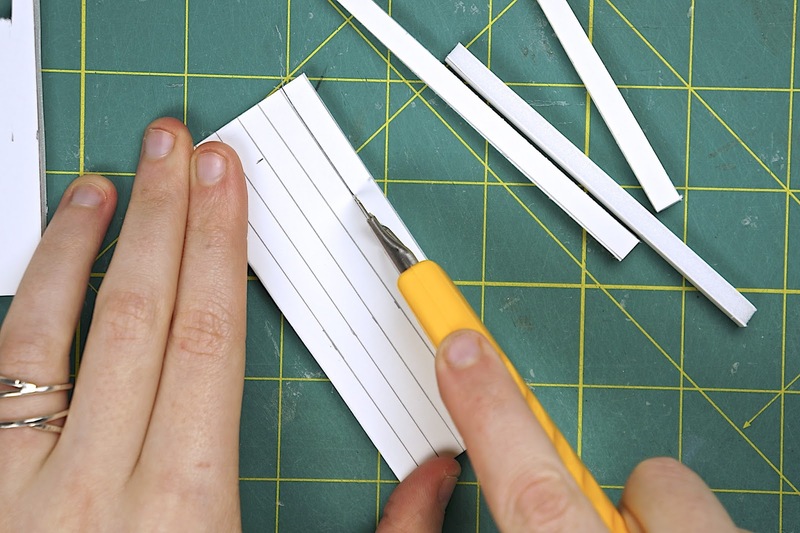 Cut out your strips. 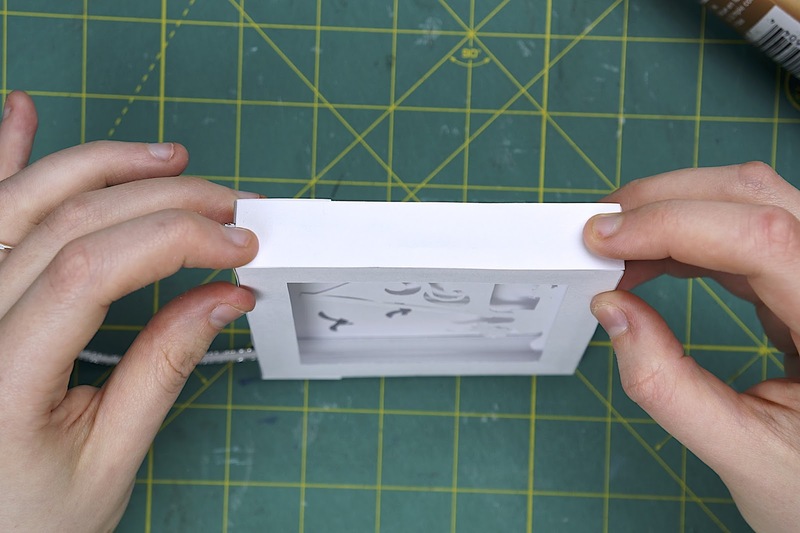 Make 2 more strips that are the thickness of your lightbox by the height of your lightbox. 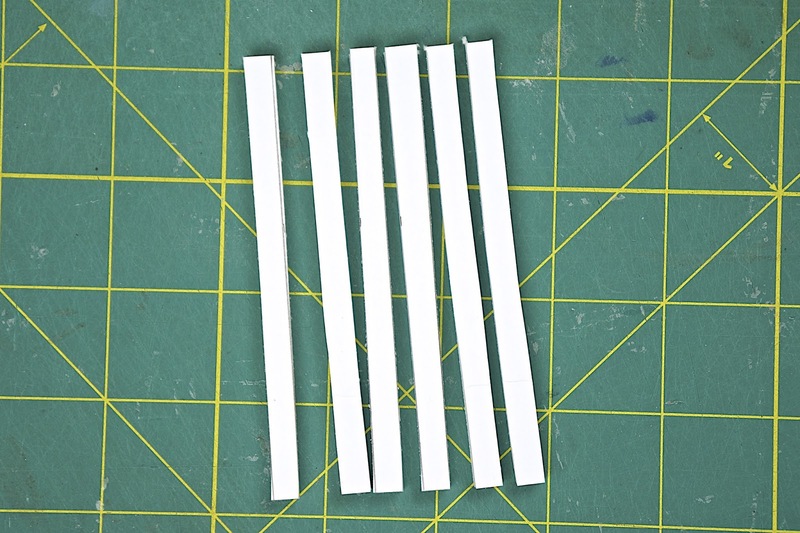 Cut out those strips as well. 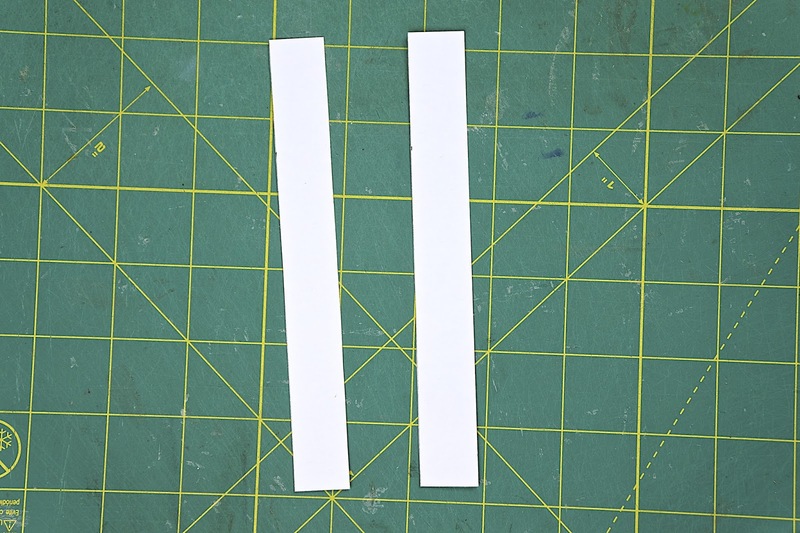 You should have 4 strips, 2 longer ones and 2 shorter ones. 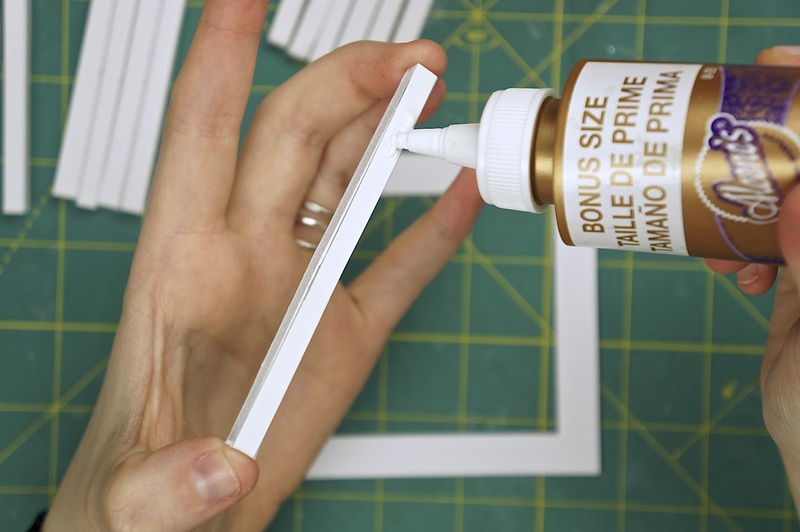 Glue one of your longer strips to the top edge of your lightbox so that you have an even amount of excess hanging off of either side. 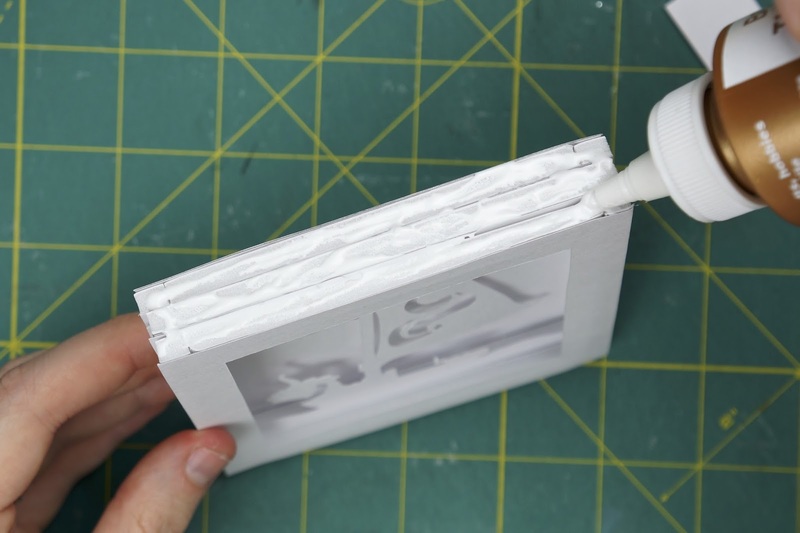 Glue the other long strip to the bottom side of the lightbox. 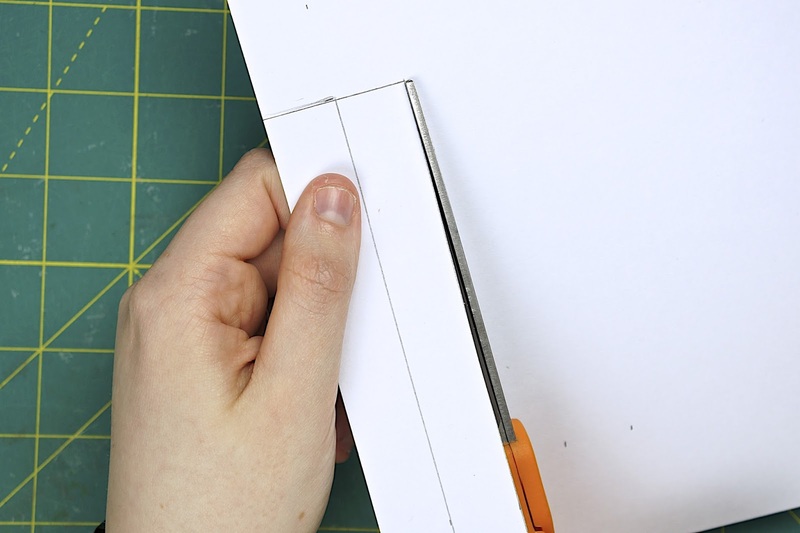 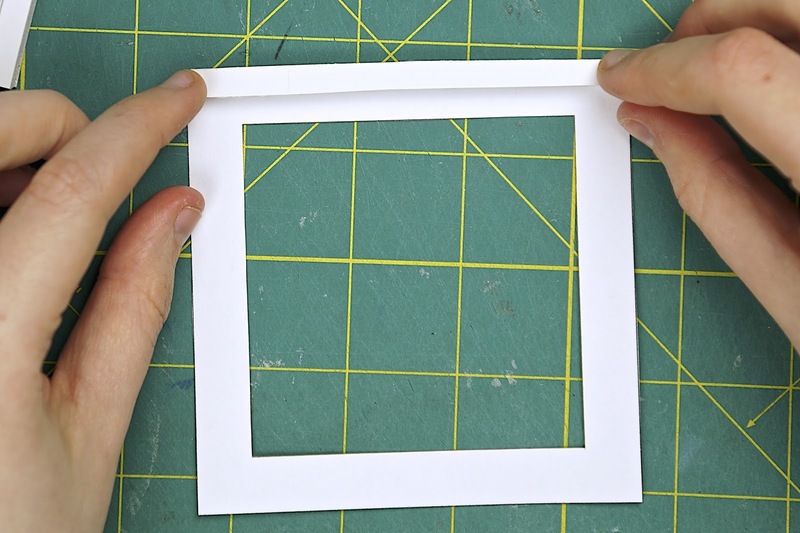 Fold the ends of the long strips downwards and glue them to the sides of the lightbox. 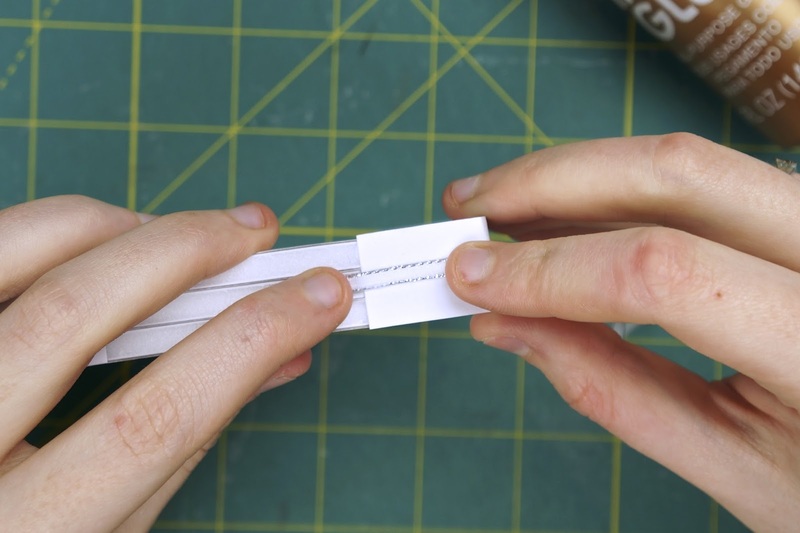 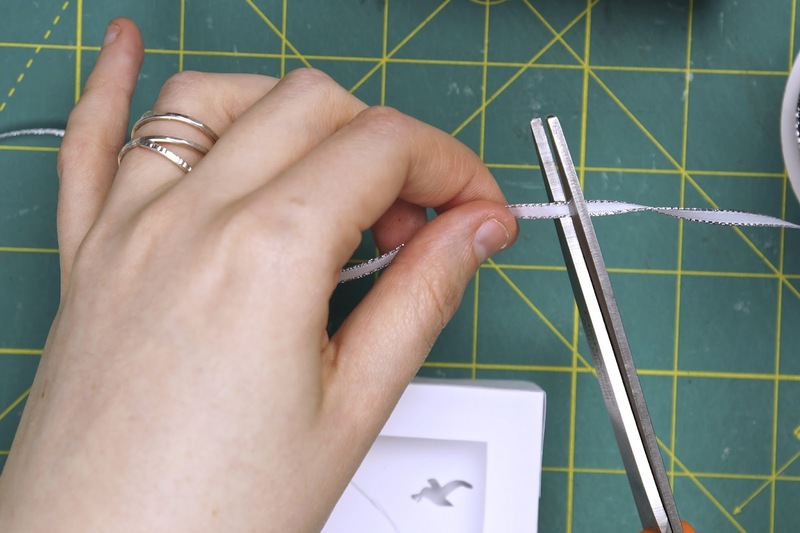 Cut a length of ribbon or string making sure that you have enough length for the ends to be glued down. 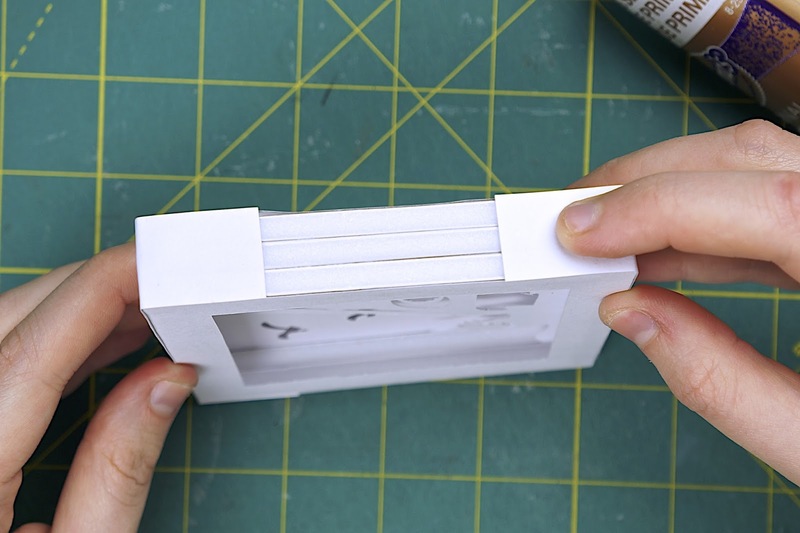 Glue one end of the ribbon to one of the upper sides of the lightbox (where the excess strip is glued down). 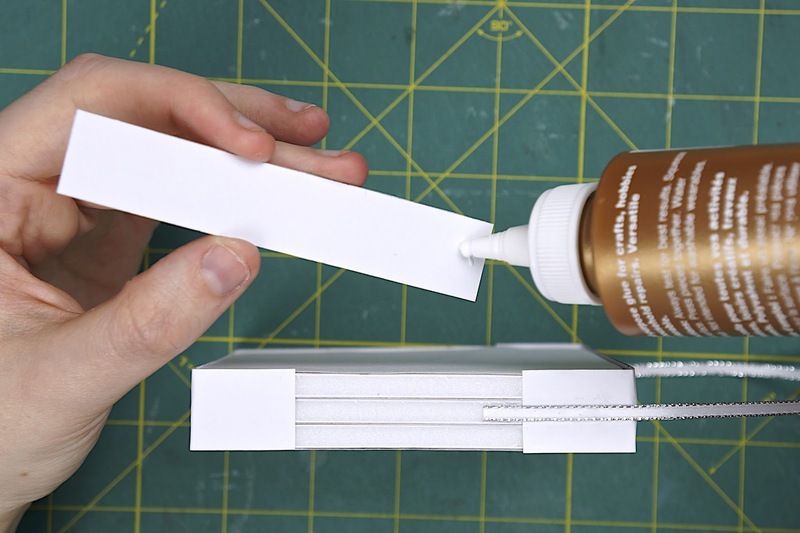 Glue the other end of the ribbon to the opposite upper side to create a loop for hanging. 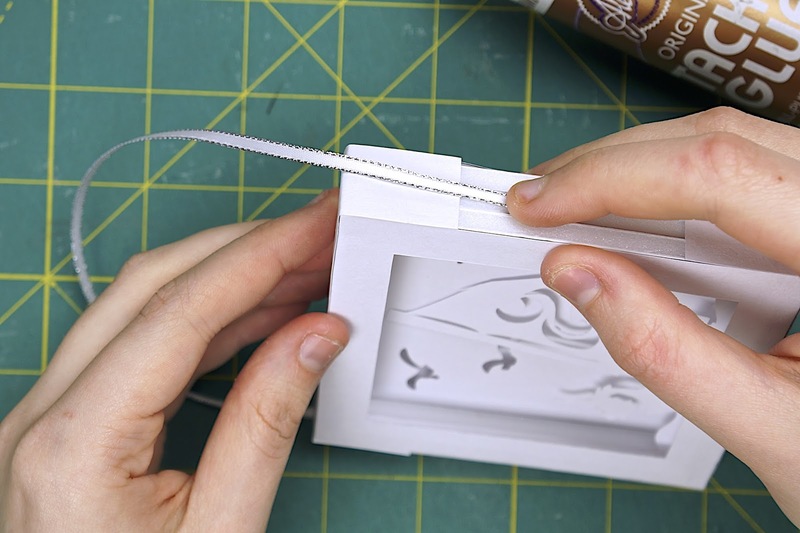 Glue the 2 shorter strips to the remaining sides of the lightbox, overtop of the ends of the ribbon. 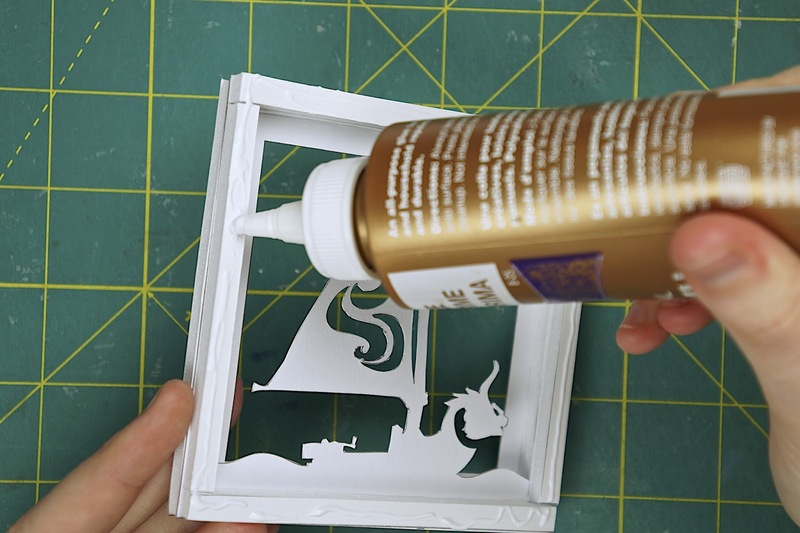 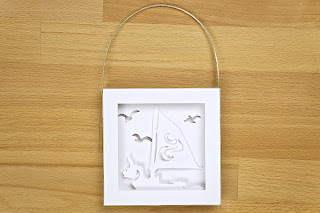 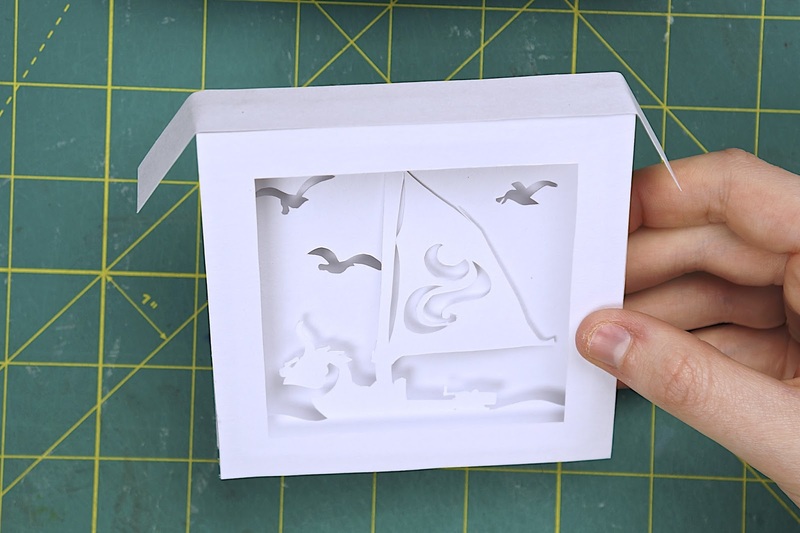 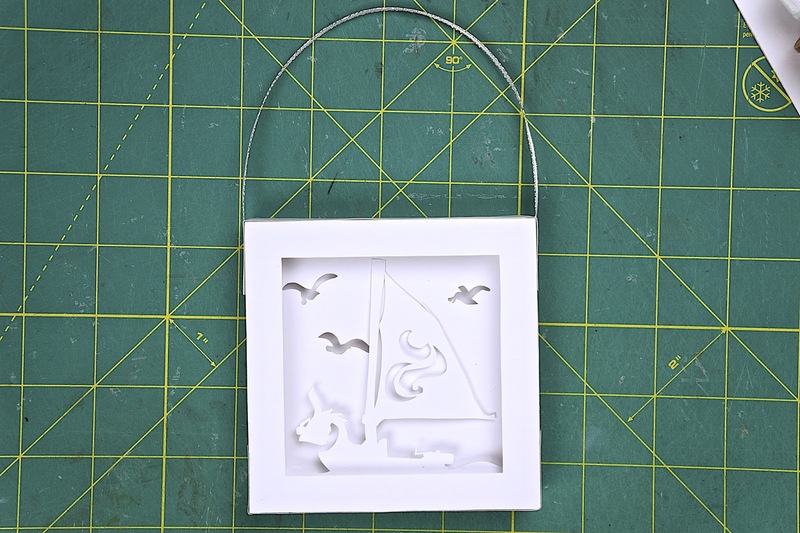 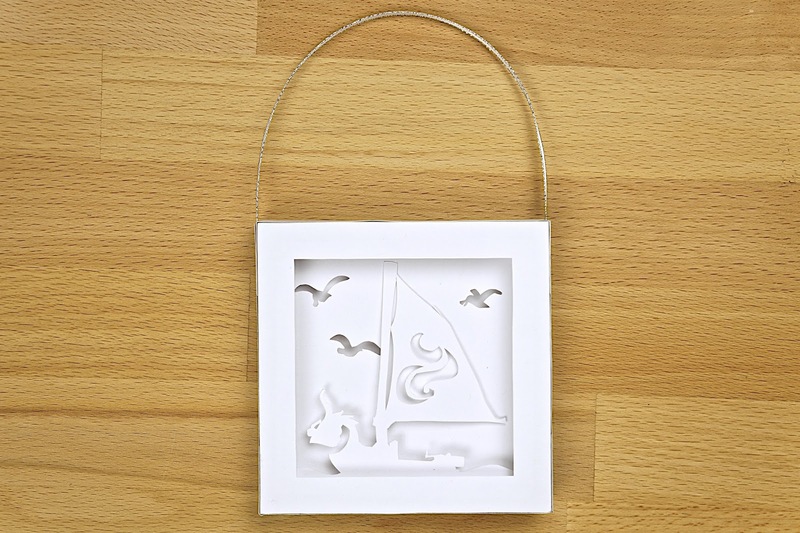 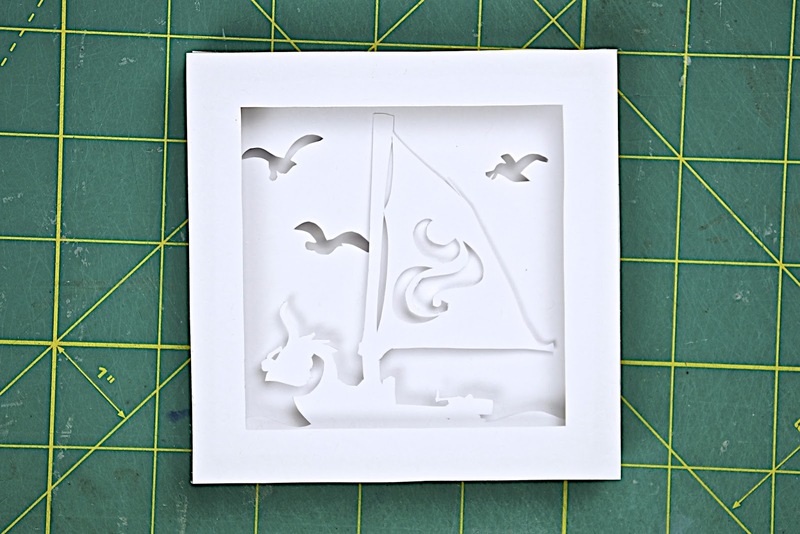 Now you have your finished paper lightbox ornament!